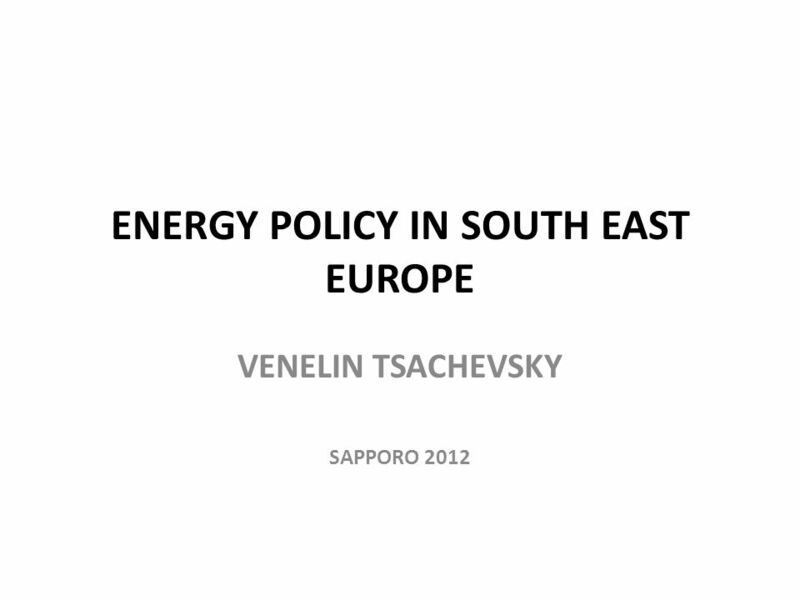 ENERGY POLICY IN SOUTH EAST EUROPE VENELIN TSACHEVSKY SAPPORO 2012. 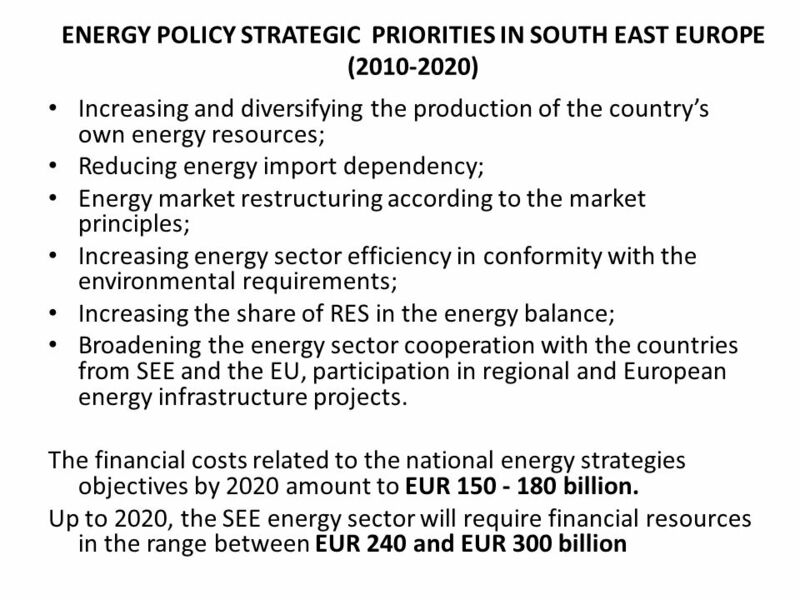 2 AIMS OF THE STUDY ENERGY ECONOMICS IN SOUTH EAST EUROPE Analysis of the energy characteristics and energy development of the region Review of the energy trends and the energy policy of the twelve SEE countries Development and significance of the nuclear energy production in SEE Trends and results of the regional energy cooperation Role of the Energy Community South East Europe as a transit corridor for the Europe-bound exports of oil and natural gas from Russia and the Caspian region. 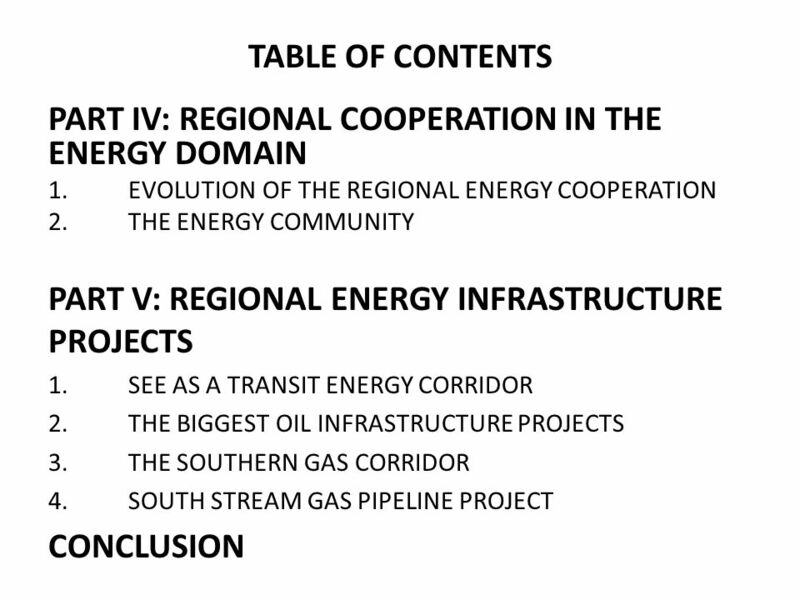 In-depth analysis of the headway achieved in the implementation of the regional and Pan-European energy infrastructure projects South East Europes prospects in terms of energy policy and development. 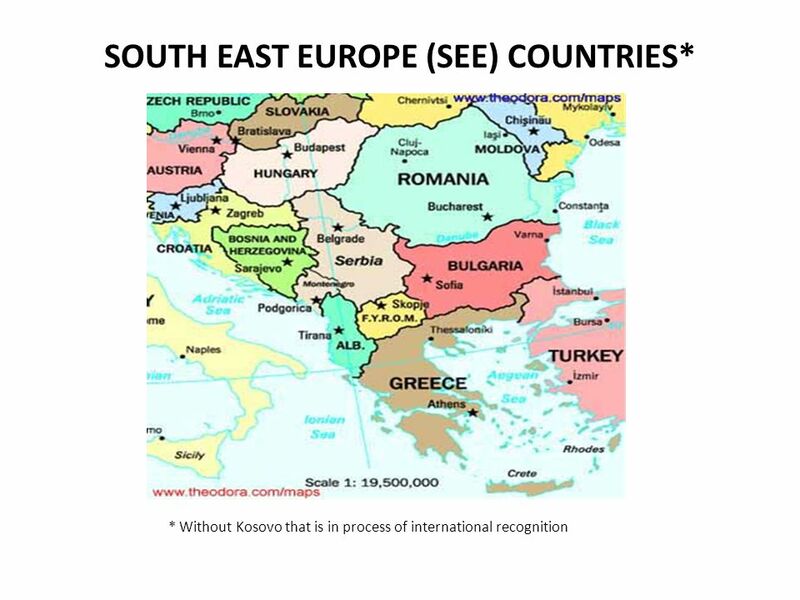 12 SEE COUNTRIES AND EU Four countries (Greece, Slovenia, Bulgaria and Romania) are members of the EU. 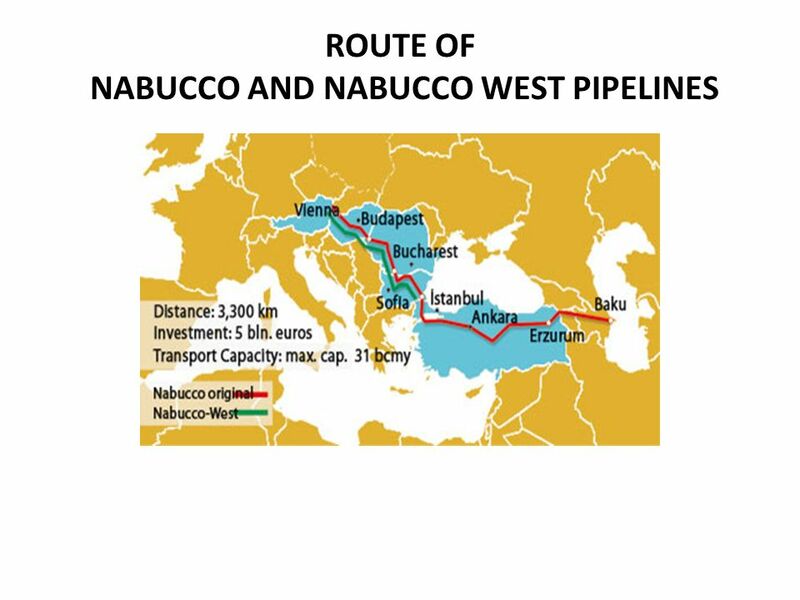 Their accession has extended the EU boundaries to the Black Sea and has increased the Unions policy potential in SEE. 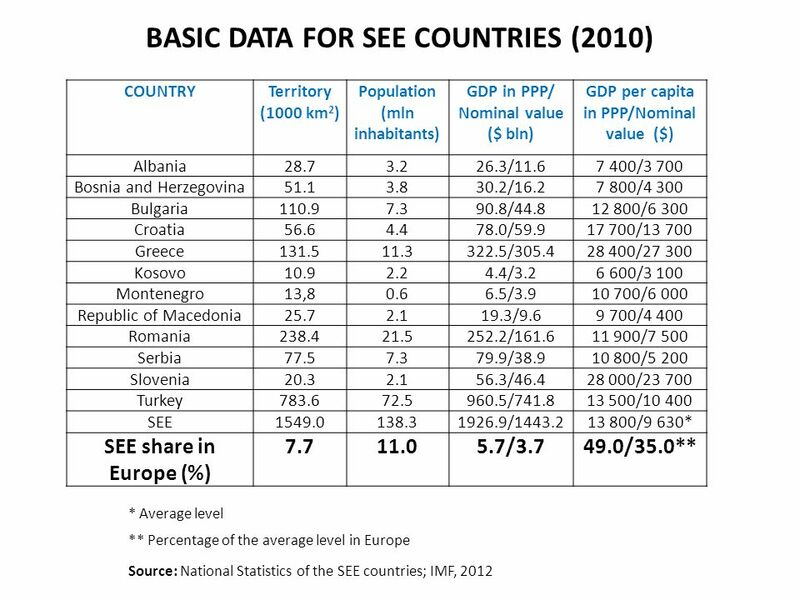 The total size of territory and population of those four countries constitute one-third of SEE and their gross product accounts for more than 35% of the regions volume. Croatia has concluded its accession negotiation and has signed the Accession Treaty. 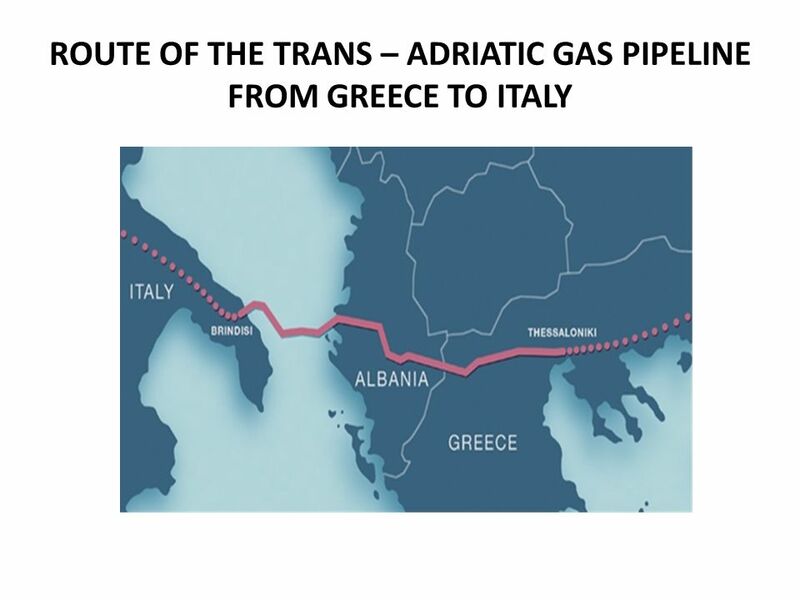 It will join the EU as the 28th member state upon the completion of the ratification process which is expected to happen on 1 July 2013. Turkey is currently conducting accession negotiations with the EU. 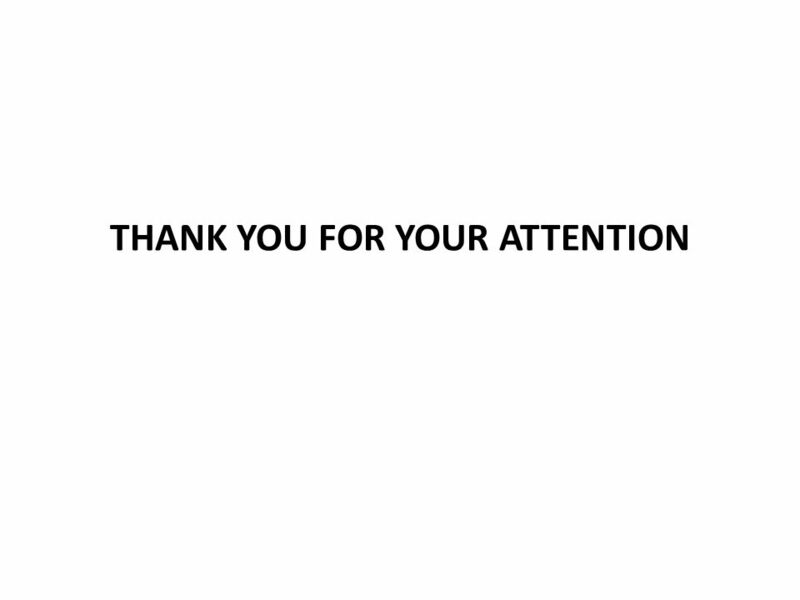 There has been specified no closing date. 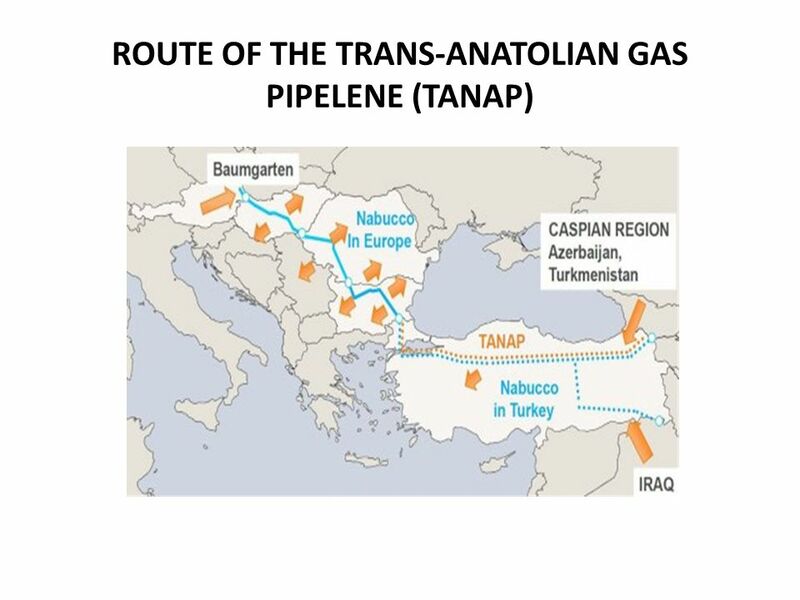 Its membership is uncertain since some EU member states consider that Turkey should be granted privileged partner status instead of a full-fledged EU membership. 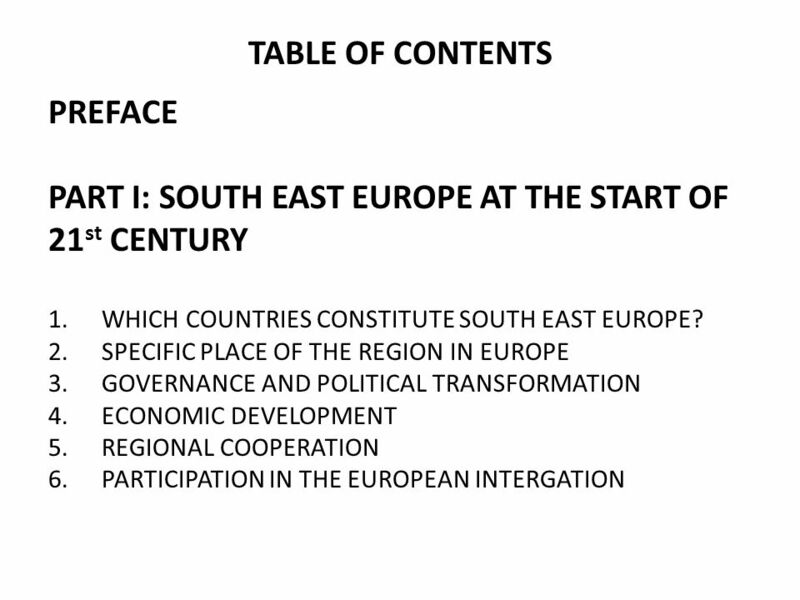 Four countries (Republic of Macedonia, Montenegro, Serbia and Albania) have filed an application for EU membership. 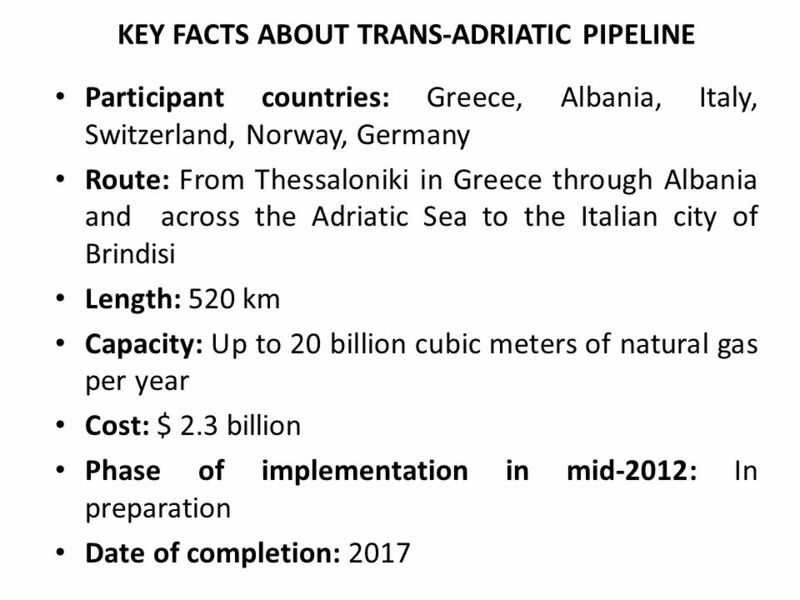 Three of them (except for Albania) have already been granted EU candidate country status. The next step is the start of formal negotiations on EU membership. 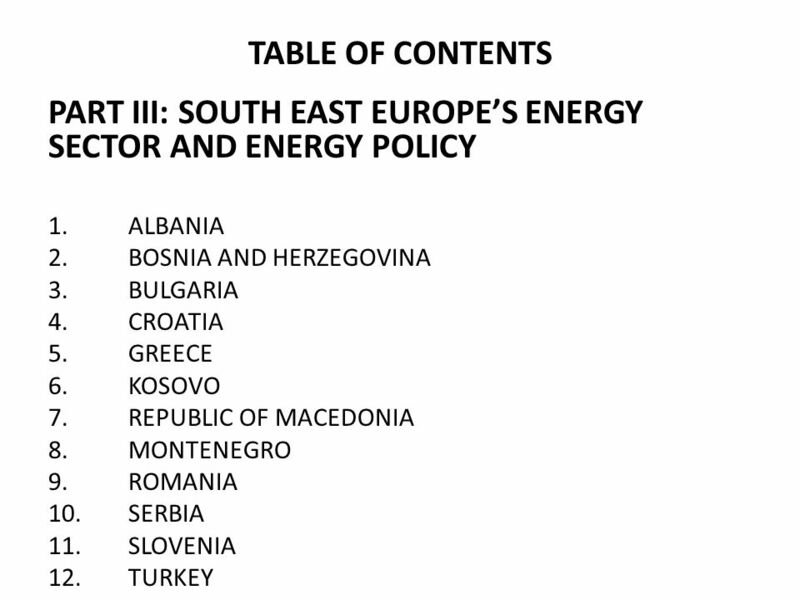 The only countries that havent submitted applications for EU membership are Bosnia and Herzegovina and Kosovo. 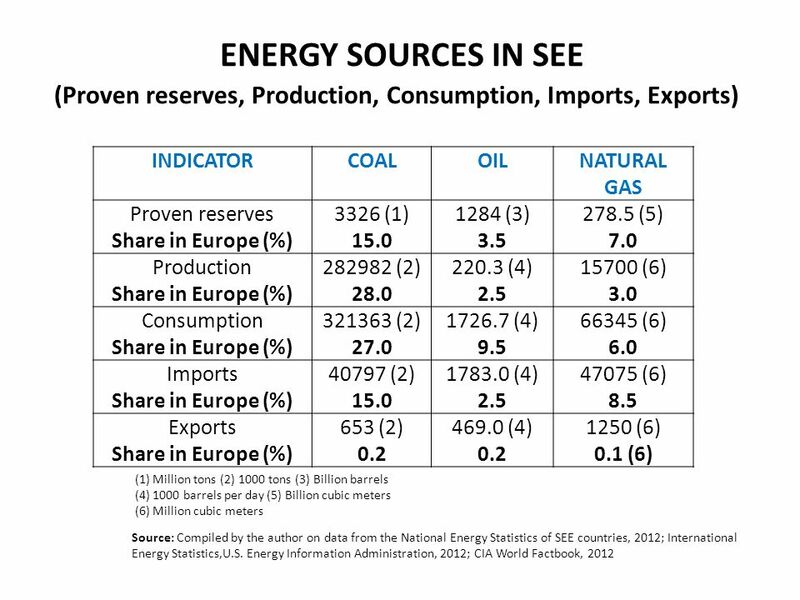 13 SEE ENERGY PROFILE SEE is relatively poor in natural energy resources. 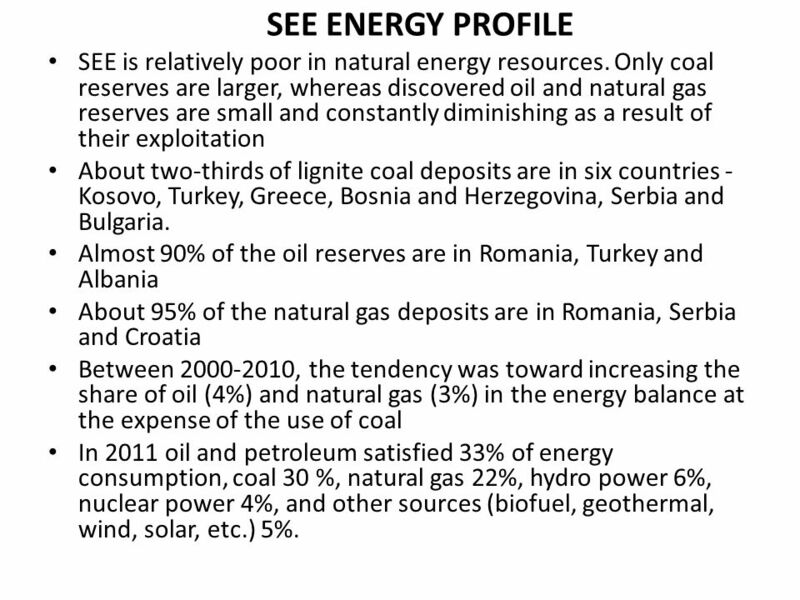 Only coal reserves are larger, whereas discovered oil and natural gas reserves are small and constantly diminishing as a result of their exploitation About two-thirds of lignite coal deposits are in six countries - Kosovo, Turkey, Greece, Bosnia and Herzegovina, Serbia and Bulgaria. 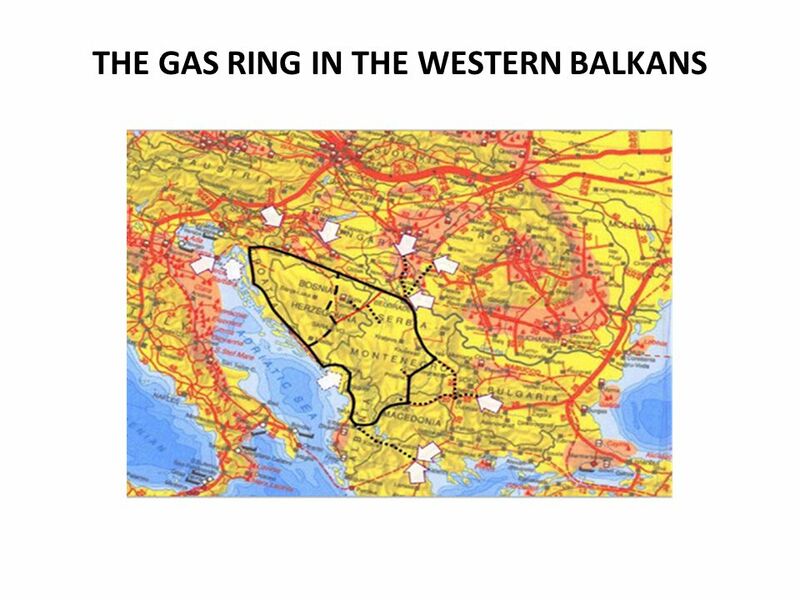 Almost 90% of the oil reserves are in Romania, Turkey and Albania About 95% of the natural gas deposits are in Romania, Serbia and Croatia Between 2000-2010, the tendency was toward increasing the share of oil (4%) and natural gas (3%) in the energy balance at the expense of the use of coal In 2011 oil and petroleum satisfied 33% of energy consumption, coal 30 %, natural gas 22%, hydro power 6%, nuclear power 4%, and other sources (biofuel, geothermal, wind, solar, etc.) 5%. 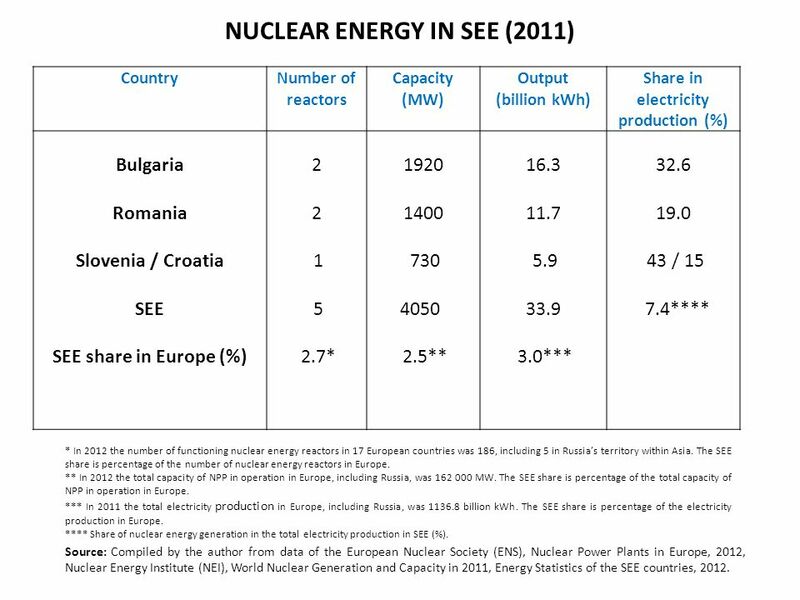 15 NUCLEAR ENERGY IN SEE (2011) CountryNumber of reactors Capacity (МW) Output (billion kWh) Share in electricity production (%) Bulgaria Romania Slovenia / Croatia SEE SEE share in Europe (%) 2 2 1 5 2.7* 1920 1400 730 4050 2.5** 16.3 11.7 5.9 33.9 3.0*** 32.6 19.0 43 / 15 7.4**** * In 2012 the number of functioning nuclear energy reactors in 17 European countries was 186, including 5 in Russias territory within Asia. The SEE share is percentage of the number of nuclear energy reactors in Europe. 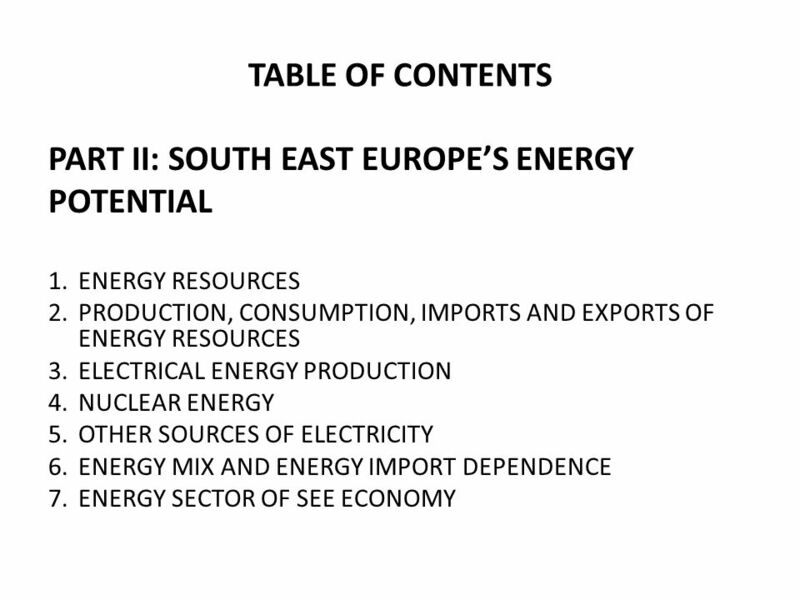 ** In 2012 the total capacity of NPP in operation in Europe, including Russia, was 162 000 MW. 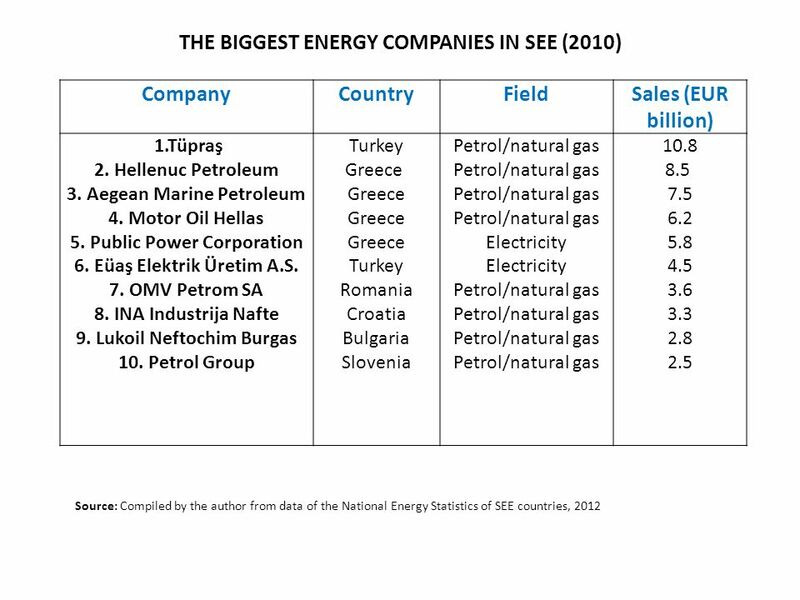 The SEE share is percentage of the total capacity of NPP in operation in Europe. 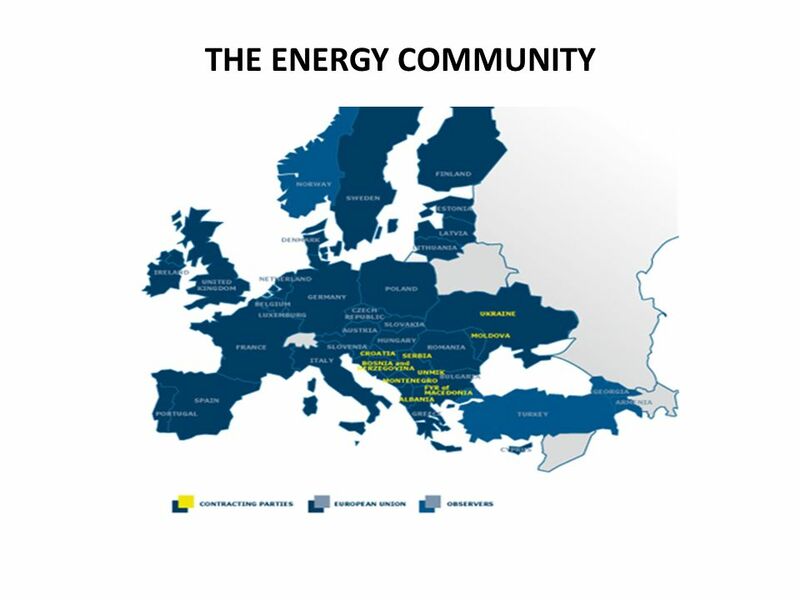 *** In 2011 the total electricity production in Europe, including Russia, was 1136.8 billion kWh. The SEE share is percentage of the electricity production in Europe. **** Share of nuclear energy generation in the total electricity production in SEE (%). 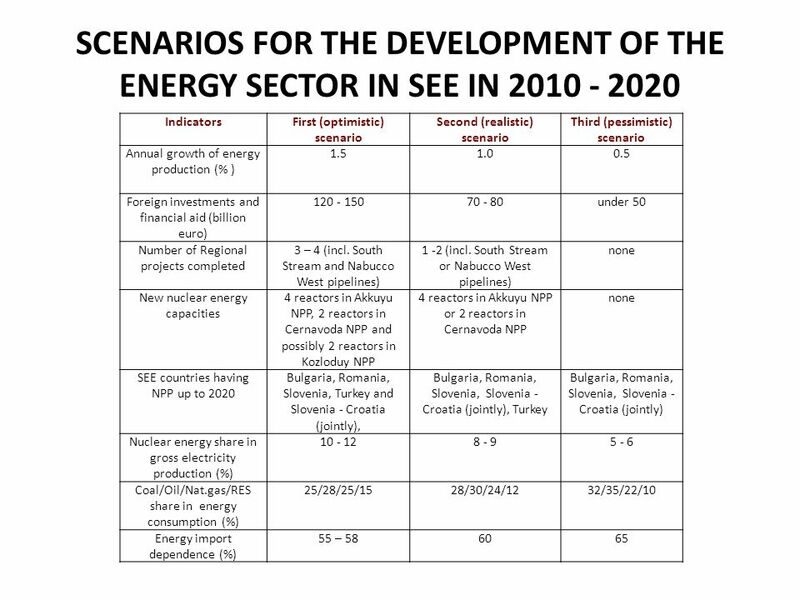 Source: Compiled by the author from data of the European Nuclear Society (ENS), Nuclear Power Plants in Europe, 2012, Nuclear Energy Institute (NEI), World Nuclear Generation and Capacity in 2011, Energy Statistics of the SEE countries, 2012. 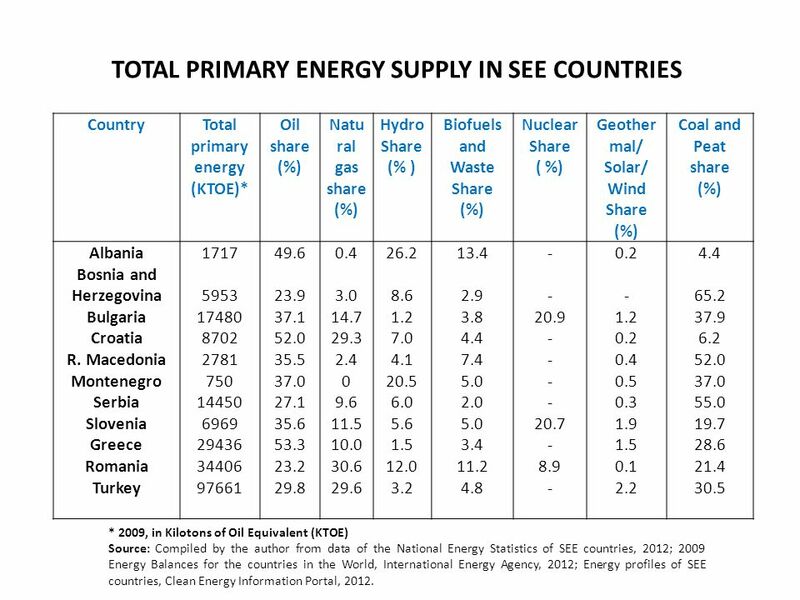 16 TOTAL PRIMARY ENERGY SUPPLY IN SEE COUNTRIES CountryTotal primary energy (KTOE)* Oil share (%) Natu ral gas share (%) Hydro Share (% ) Biofuels and Waste Share (%) Nuclear Share ( %) Geother mal/ Solar/ Wind Share (%) Coal and Peat share (%) Albania Bosnia and Herzegovina Bulgaria Croatia R. Macedonia Montenegro Serbia Slovenia Greece Romania Turkey 1717 5953 17480 8702 2781 750 14450 6969 29436 34406 97661 49.6 23.9 37.1 52.0 35.5 37.0 27.1 35.6 53.3 23.2 29.8 0.4 3.0 14.7 29.3 2.4 0 9.6 11.5 10.0 30.6 29.6 26.2 8.6 1.2 7.0 4.1 20.5 6.0 5.6 1.5 12.0 3.2 13.4 2.9 3.8 4.4 7.4 5.0 2.0 5.0 3.4 11.2 4.8 - - 20.9 - 20.7 - 8.9 - 0.2 - 1.2 0.2 0.4 0.5 0.3 1.9 1.5 0.1 2.2 4.4 65.2 37.9 6.2 52.0 37.0 55.0 19.7 28.6 21.4 30.5 * 2009, in Kilotons of Oil Equivalent (KTOE) Source: Compiled by the author from data of the National Energy Statistics of SEE countries, 2012; 2009 Energy Balances for the countries in the World, International Energy Agency, 2012; Energy profiles of SEE countries, Clean Energy Information Portal, 2012. 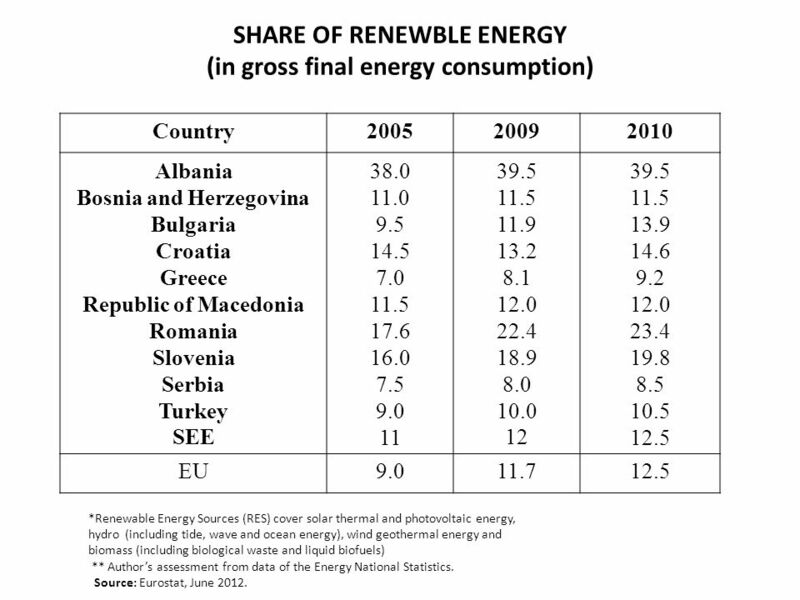 17 SHARE OF RENEWBLE ENERGY (in gross final energy consumption) Country200520092010 Albania Bosnia and Herzegovina Bulgaria Croatia Greece Republic of Macedonia Romania Slovenia Serbia Turkey SEE 38.0 11.0 9.5 14.5 7.0 11.5 17.6 16.0 7.5 9.0 11 39.5 11.5 11.9 13.2 8.1 12.0 22.4 18.9 8.0 10.0 12 39.5 11.5 13.9 14.6 9.2 12.0 23.4 19.8 8.5 10.5 12.5 EU9.011.712.5 *Renewable Energy Sources (RES) cover solar thermal and photovoltaic energy, hydro (including tide, wave and ocean energy), wind geothermal energy and biomass (including biological waste and liquid biofuels) ** Authors assessment from data of the Energy National Statistics. 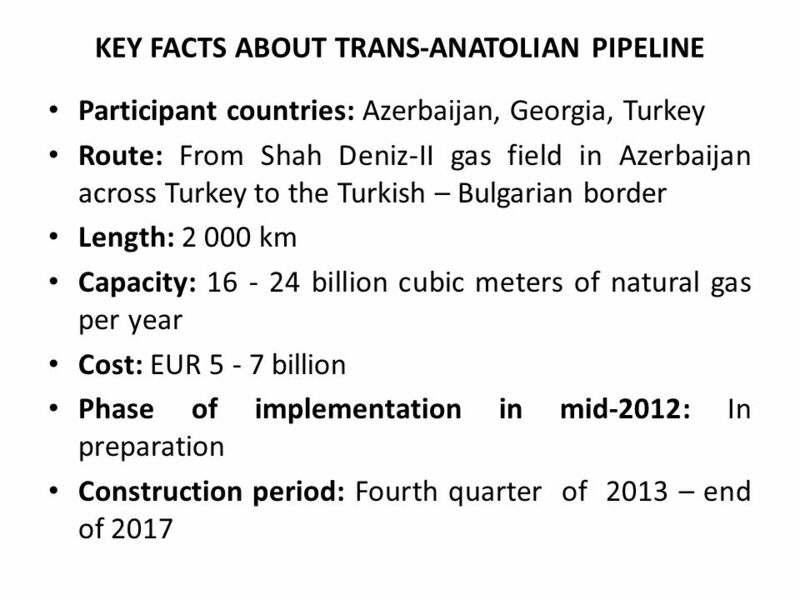 Source: Eurostat, June 2012. 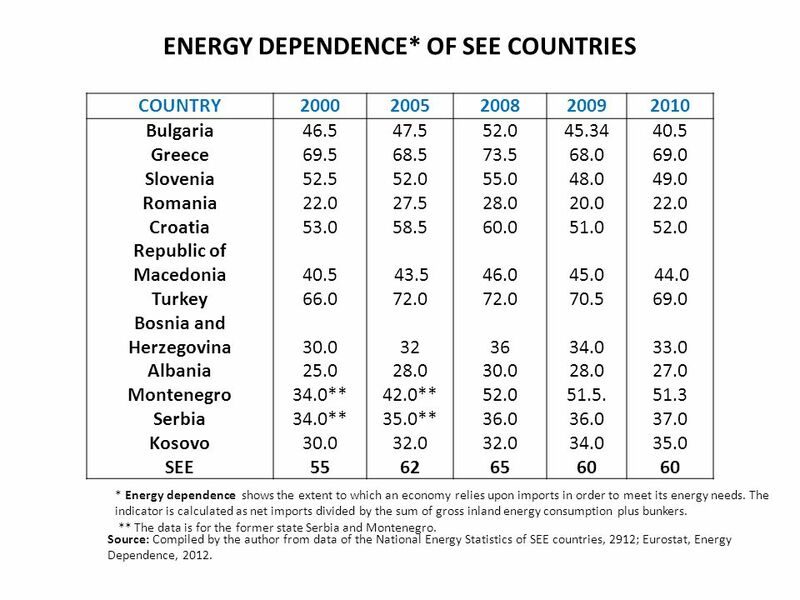 18 ENERGY DEPENDENCE* OF SEE COUNTRIES COUNTRY20002005200820092010 Bulgaria Greece Slovenia Romania Croatia Republic of Macedonia Turkey Bosnia and Herzegovina Albania Montenegro Serbia Kosovo SEE 46.5 69.5 52.5 22.0 53.0 40.5 66.0 30.0 25.0 34.0** 30.0 55 47.5 68.5 52.0 27.5 58.5 43.5 72.0 32 28.0 42.0** 35.0** 32.0 62 52.0 73.5 55.0 28.0 60.0 46.0 72.0 36 30.0 52.0 36.0 32.0 65 45.34 68.0 48.0 20.0 51.0 45.0 70.5 34.0 28.0 51.5. 36.0 34.0 60 40.5 69.0 49.0 22.0 52.0 44.0 69.0 33.0 27.0 51.3 37.0 35.0 60 * Energy dependence shows the extent to which an economy relies upon imports in order to meet its energy needs. 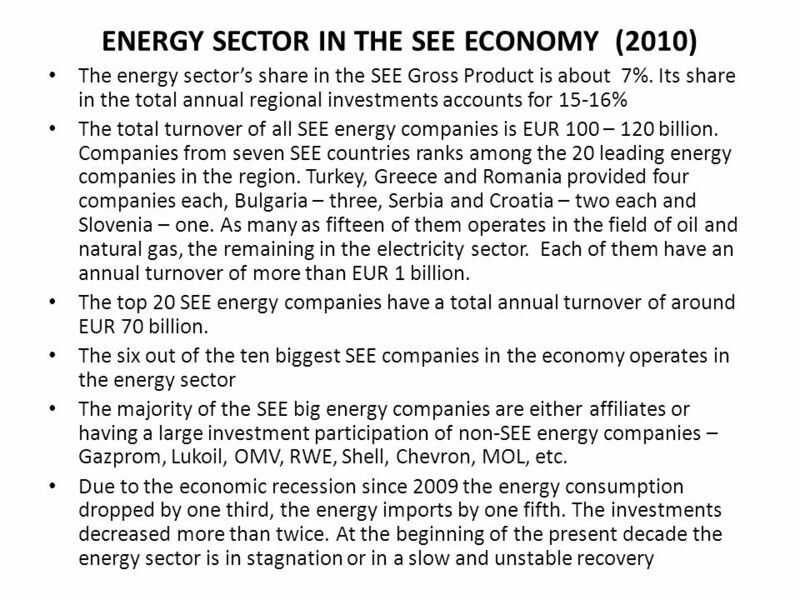 The indicator is calculated as net imports divided by the sum of gross inland energy consumption plus bunkers. 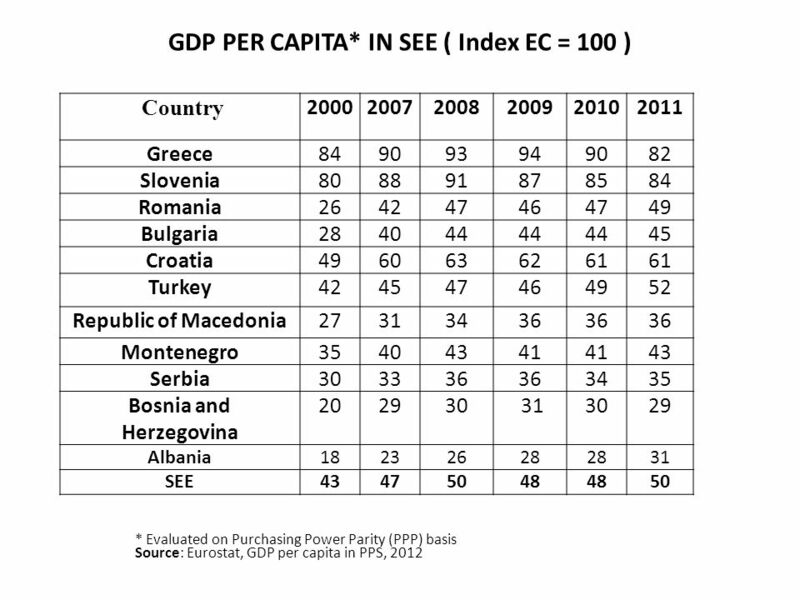 ** The data is for the former state Serbia and Montenegro. 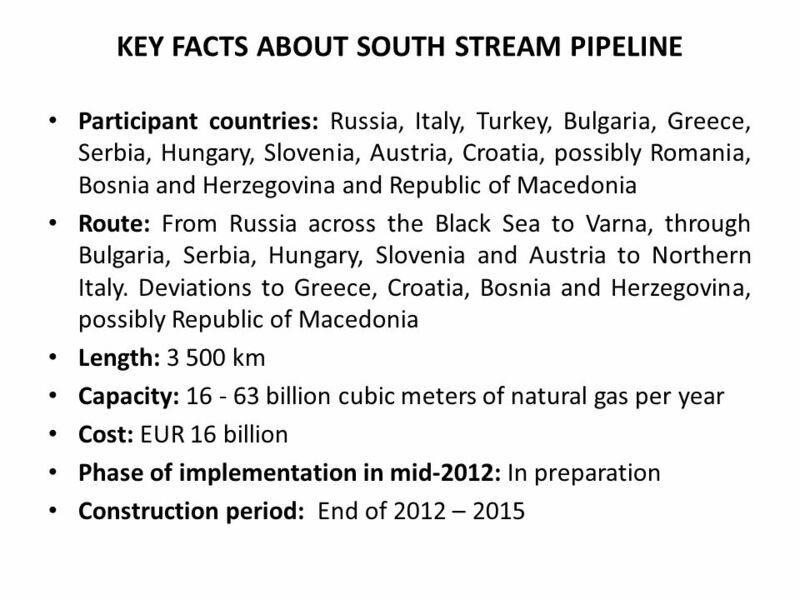 Source: Compiled by the author from data of the National Energy Statistics of SEE countries, 2912; Eurostat, Energy Dependence, 2012. 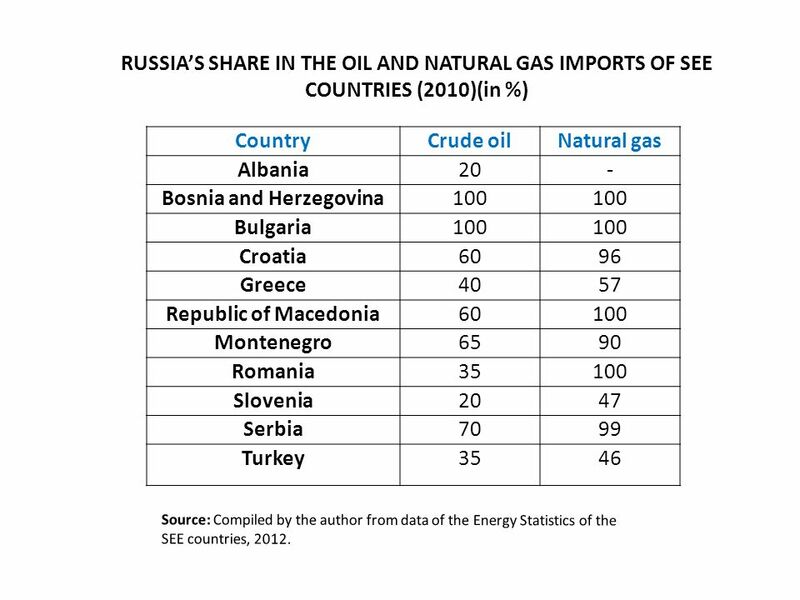 25 RUSSIAS SHARE IN THE OIL AND NATURAL GAS IMPORTS OF SEE COUNTRIES (2010)(in %) CountryCrude oilNatural gas Albania20- Bosnia and Herzegovina100 Bulgaria100 Croatia6096 Greece4057 Republic of Macedonia60100 Montenegro6590 Romania35100 Slovenia2047 Serbia7099 Turkey3546 Source: Compiled by the author from data of the Energy Statistics of the SEE countries, 2012. 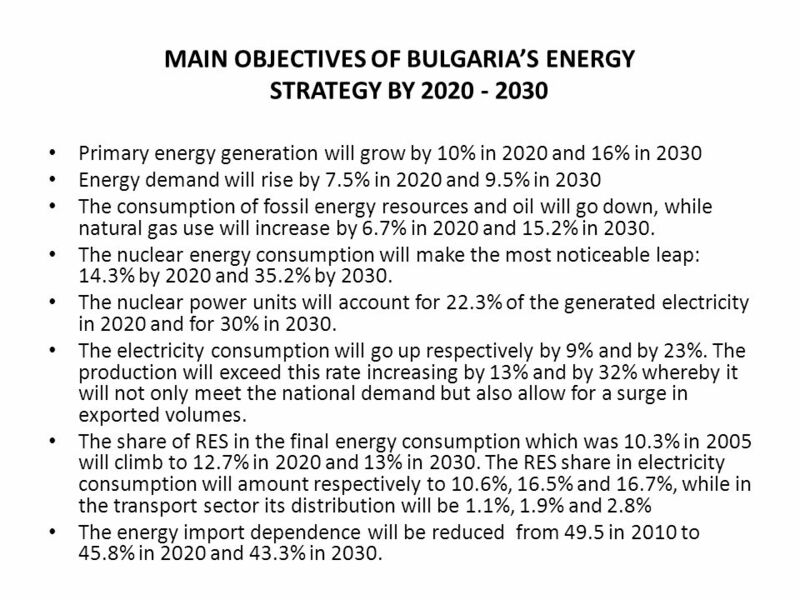 35 MAIN OBJECTIVES OF BULGARIAS ENERGY STRATEGY BY 2020 - 2030 Primary energy generation will grow by 10% in 2020 and 16% in 2030 Energy demand will rise by 7.5% in 2020 and 9.5% in 2030 The consumption of fossil energy resources and oil will go down, while natural gas use will increase by 6.7% in 2020 and 15.2% in 2030. The nuclear energy consumption will make the most noticeable leap: 14.3% by 2020 and 35.2% by 2030. The nuclear power units will account for 22.3% of the generated electricity in 2020 and for 30% in 2030. The electricity consumption will go up respectively by 9% and by 23%. The production will exceed this rate increasing by 13% and by 32% whereby it will not only meet the national demand but also allow for a surge in exported volumes. 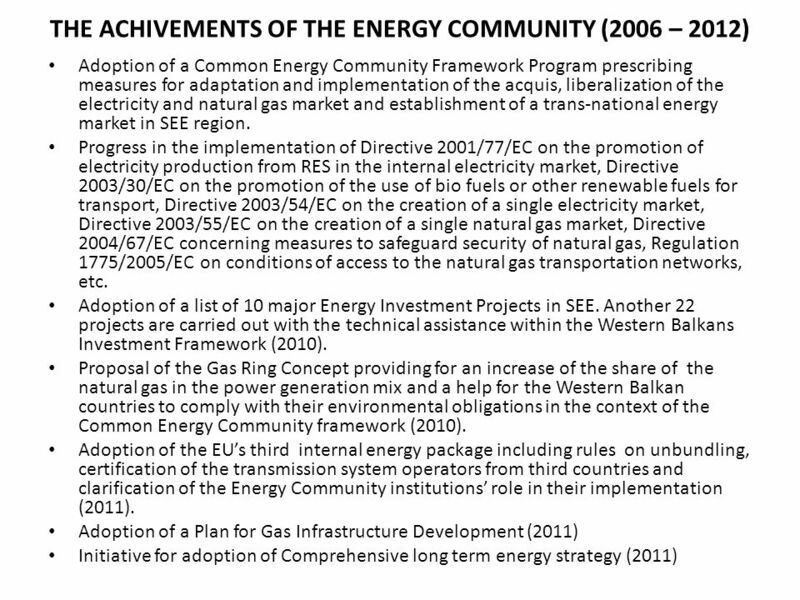 The share of RES in the final energy consumption which was 10.3% in 2005 will climb to 12.7% in 2020 and 13% in 2030. The RES share in electricity consumption will amount respectively to 10.6%, 16.5% and 16.7%, while in the transport sector its distribution will be 1.1%, 1.9% and 2.8% The energy import dependence will be reduced from 49.5 in 2010 to 45.8% in 2020 and 43.3% in 2030. 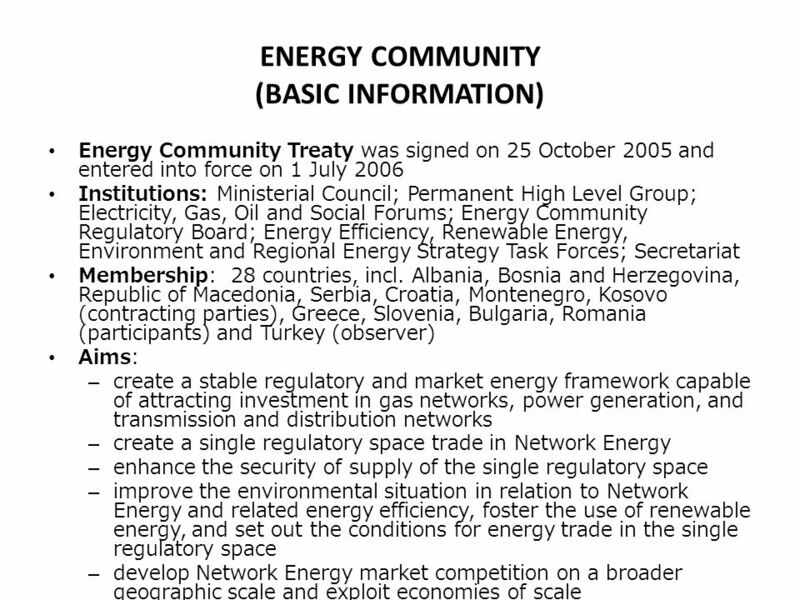 37 TOSHIBAS ENERGY PROJECTS IN BULGARIA (2011-2012) January 2011: Toshiba and the Bulgarian Energy Holding (BEH) signed a memorandum for the development of smart electric grids in Bulgaria and the introduction of electric cars based on renewable energy sources. 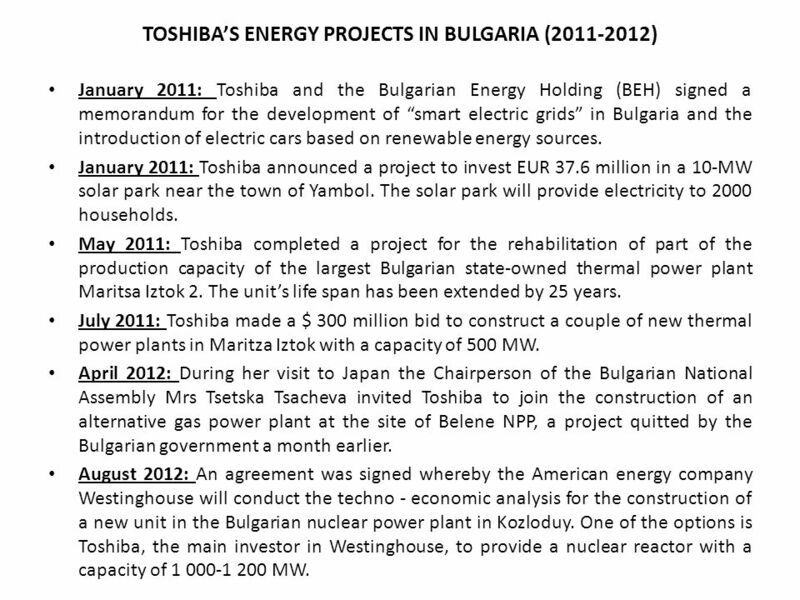 January 2011: Toshiba announced a project to invest EUR 37.6 million in a 10-MW solar park near the town of Yambol. The solar park will provide electricity to 2000 households. May 2011: Toshiba completed a project for the rehabilitation of part of the production capacity of the largest Bulgarian state-owned thermal power plant Maritsa Iztok 2. The units life span has been extended by 25 years. July 2011: Toshiba made a $ 300 million bid to construct a couple of new thermal power plants in Maritza Iztok with a capacity of 500 MW. 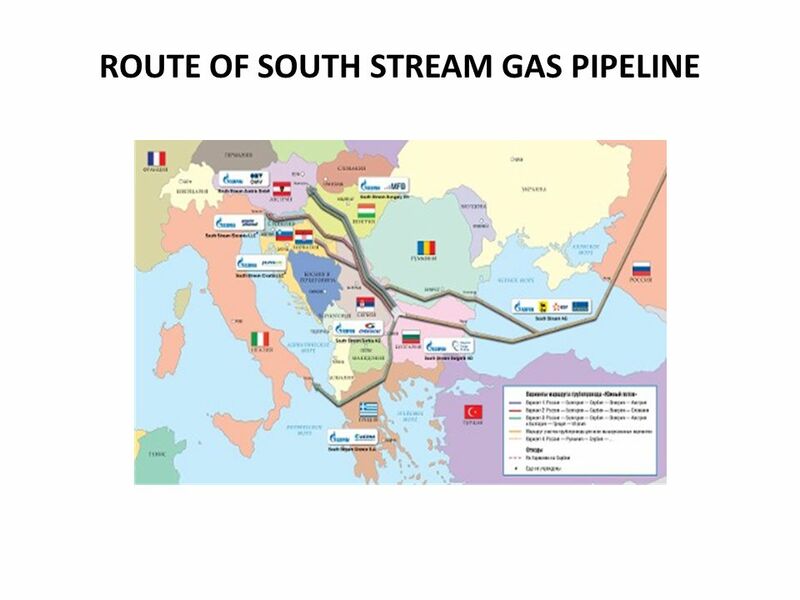 April 2012: During her visit to Japan the Chairperson of the Bulgarian National Assembly Mrs Tsetska Tsacheva invited Toshiba to join the construction of an alternative gas power plant at the site of Belene NPP, a project quitted by the Bulgarian government a month earlier. 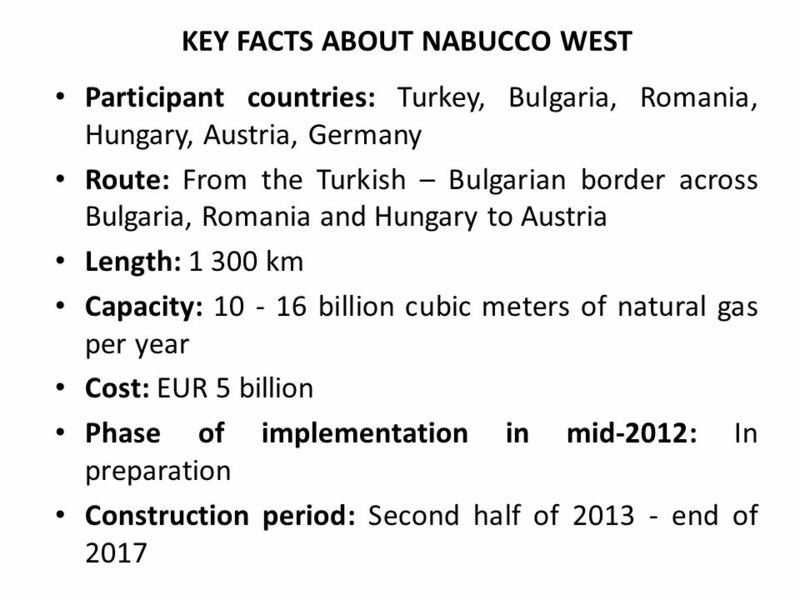 August 2012: An agreement was signed whereby the American energy company Westinghouse will conduct the techno - economic analysis for the construction of a new unit in the Bulgarian nuclear power plant in Kozloduy. One of the options is Toshiba, the main investor in Westinghouse, to provide a nuclear reactor with a capacity of 1 000-1 200 MW. 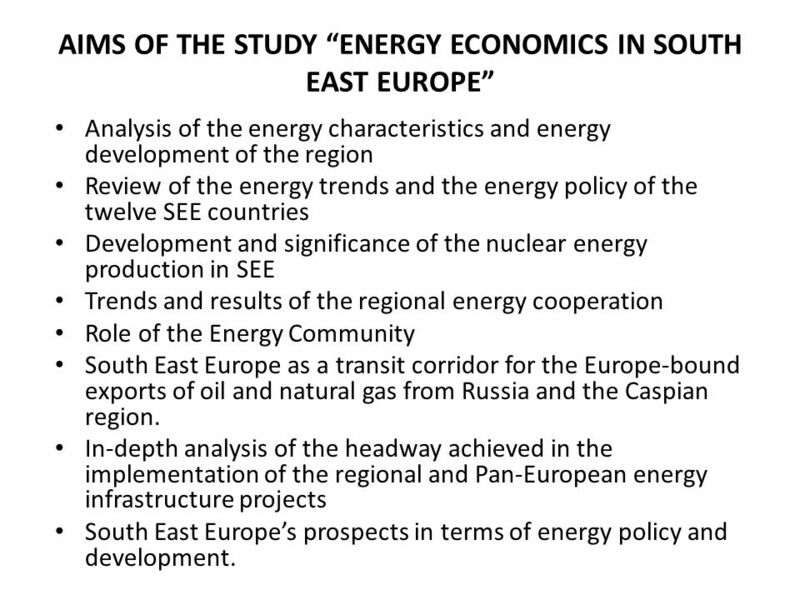 Download ppt "ENERGY POLICY IN SOUTH EAST EUROPE VENELIN TSACHEVSKY SAPPORO 2012."